Kanhaiya Kumar is a former President of the Jawaharlal Nehru University Students' Union. He is also a leader of the All India Students Federation (AISF), the student wing of the Communist Party of India (CPI). Kanhaiya graduated with a degree in geography from the College of Commerce, Patna in 2007, earning a "first class. " While at the College of Commerce, he began his involvement in student politics. He joined the AISF and a year later was selected as a delegate at its conference in Patna. 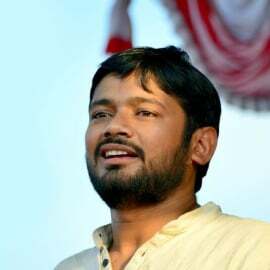 After completing his post graduation with a MA in sociology from Nalanda Open University in Patna, again securing a first class, Kanhaiya Kumar moved to Delhi and after ranking first in the JNU entrance exam in 2011, joined JNU where he is currently pursuing a PhD in African studies at the School of International Studies. Kumar's autobiography, Bihar to Tihar: My Political Journey was published in October 2016. The book is his story from his childhood in rural Bihar, college days in Patna, to his political coming of age in Delhi.